Lahore, February 27: The Human Rights Commission of Pakistan (HRCP) has expressed shock and alarm at the deviations from normal sensible behaviour that were witnessed during by-elections held in ten constituencies on Sunday. Lahore, February 9: The Human Rights Commission of Pakistan (HRCP) has strongly condemned the recent developments atSindh University where, following the killing of Professor Bashir Channar on January 2, unjustified action has been taken against protesting teachers. A statement issued by the Commission on Thursday said: “HRCP notes with alarm that the services of two representatives of Sindh University Teachers’ Association, Dr. Arfana Mallah and Dr. Azhar Ali Shah, have been terminated and show-cause notices issued to other teachers. The university had only reopened a few days ago on the assurance of the Sindh Governor that the vice-chancellor of Sindh University, who is past the age of retirement, would be replaced in accordance with the demands of the teachers. “HRCP also has serious reservations over the authorities’ apathetic approach towards acknowledging and addressing teachers’ concerns. It defies reason why the teachers must protests for weeks upon weeks before their concerns register on the official radar. The teachers have protested long and in a peaceful manner for demands that are not unreasonable: a judicial probe into the assassination of Professor Bashir, withdrawal of police and Rangers from the campus, restoration of student unions and removal of the vice chancellor. Lahore, February 8: The Human Rights Commission of Pakistan (HRCP) has expressed alarm and incredulity at the shoddy state of affairs that led to the tragic death of nearly two dozen people in Lahore when a boiler explosion reportedly brought down a three-storey ‘pharmaceutical laboratory’. In a statement on Wednesday, the Commission said: “Our heart goes out to the families of the poor workers killed in the collapse of a so-called pharmaceutical laboratory building in Lahore on Monday. The disaster has exposed the utter non-existence of any regulatory system, which is as horrific as it is incredible. We now learn that the factory was operating without a licence and in a residential area, that most of the workers were women and very young children employed in clearly exploitative conditions, that the establishment had not been assessed for environmental impact and the premises had not been inspected because the provincial government have abolished labour inspectors’ visits to factories since 2002. The banning of labour inspection is a travesty that amounts to the government’s acquiescence into industrialists’ greedy operations above all else. How such an indefensible policy continues to prevail says something about the persuasive power of big business. Lahore, February 6: The Human Rights Commission of Pakistan (HRCP) has expressed serious concern at the death of two men in Sibi on Saturday when security forces personnel opened fire on demonstrators protesting against the killing of Nawab Akbar Bugti’s kin inKarachi last week. The Commission said in a statement: “HRCP regrets very much the deaths and injuries among demonstrators in Sibi when FC personnel opened fire on them. Media reports suggest that around 300 people had blocked the National Highway to protest the killings and had prevented an FC convoy from passing through. It’s four years since those pistol shots and bomb blast in Pindi’s Liaquat Bagh ended the life of Pakistan’s most promising politician and hope for democracy. 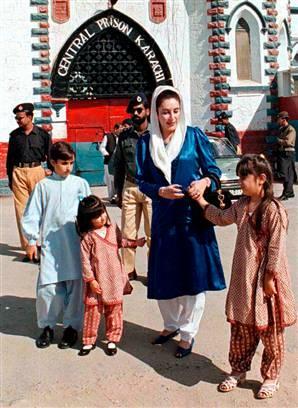 There is no one to replace Benazir Bhutto but her legacy lives on in many ways. This is the first legitimately elected government ever in Pakistan to remain in office for as long as it has – and it will be the first to complete its tenure if allowed to do so and hand over power to the next elected government. This political process is essential to move Pakistan out of a quagmire that has taken decades to push us into. There are no quick fixes, no magic wands that can change things overnight. 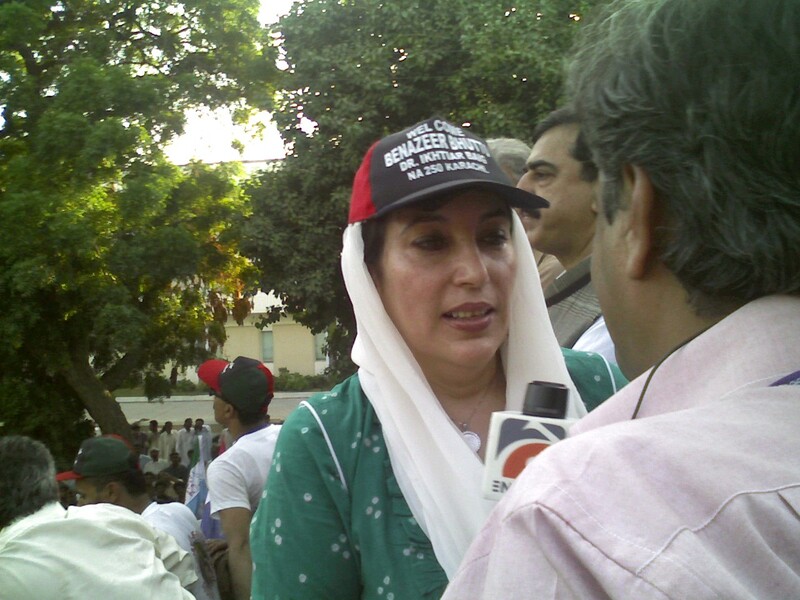 What’s important is the process and at least that is under way – thanks to Benazir Bhutto. Thanks to YouTube, archival footage is now available to remind us of her legacy. In his moving article on Benazir, Saroop Ijaz refers to this interview of her’s soon after Gen. Zia’s death, in which she outlines her political vision of looking ahead, without vindictiveness. He begins the piece with lines that Benazir Bhutto recited, quoting from Dr Khalid Javed Jan’s iconic poem on her return to Pakistan in 1986: “Mazhab kay jo byopairi hain, woh sab se baree bemaari hain…. In jhute or makkaron se, mahzab kay thekedaron say, mein baaghi hoon, mein baaghi hoon” (The traders of religion are the worst disease, I rebel from these liars and hypocrites). Complete lyrics at this link. 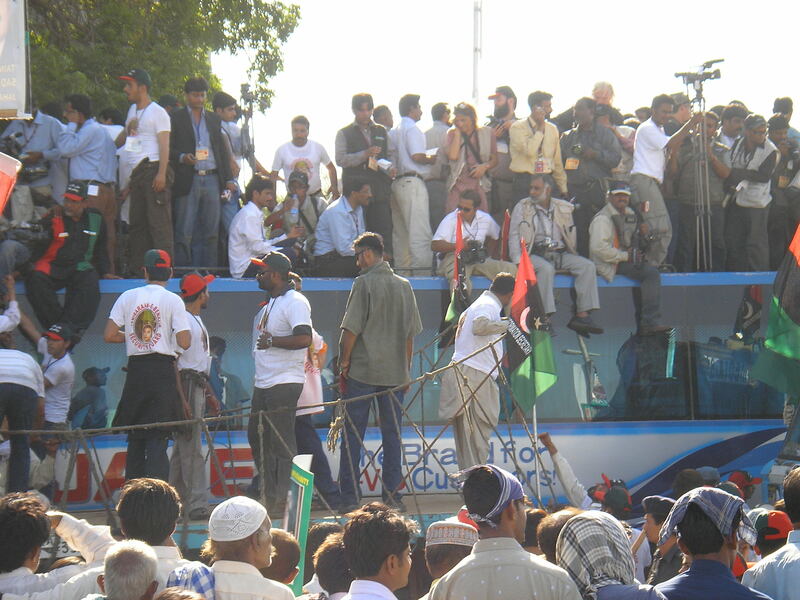 When Benazir arrived in Pakistan in October 2007, the air of anticipation was infectious. I ended up riding out to the airport on the back of a motorbike, passing hordes of celebrating people (see my cell phone photos) and pushing my way through a huge mob, past her ‘janesars’, to the top of her truck with my colleague Absar Alam who interviewed her for Geo TV (thanks to Naheed Khan who invited us up top). 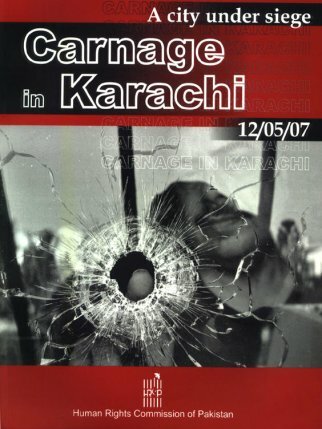 This was just hours before the bomb blast that killed over 180 people and injured scores of others, including Benazir, as her convoy passed Karsaz Road in Karachi. The next morning to everyone’s astonishment, despite her own trauma (ears oozing blood from the bomb blast), she breached security protocols to visit the injured in hospital, and by afternoon was patiently presiding over a chaotic press conference at Bilawal House. The place was ill equipped to deal with the explosion of TV channels that had taken place over the past few years. At one point, our eyes met and she smiled in recognition of the absurd situation. Barely two months later she was dead – literally having paid with her life for democracy. I was in Lahore then. As we mourned together, Hina Jillani’s observation on how much Benazir had changed during her years of exile has stayed with me. She looked different, positively radiant, with a simple plait replacing the old bouffant hairdo, no heavy make-up, her by now trademark white dupatta draped over her head rather than the earlier matching shawls and jackets with padded shoulders. She was no longer arrogant, she listened, she was willing to learn. She prevailed upon her former arch-rival Nawaz Sharif, who was dithering on the boycott issue, to agree to contest elections. Imran Khan in his wisdom, stayed out of the fray and in the political wilderness (until suddenly being projected into prominence earlier this year). The devil of course was Musharraf and the deal was the much-maligned National Reconciliation Ordinance (NRO) without which she and other politicians could not have returned to Pakistan to participate in politics. “so much so that when the forces opposing her tried to use her biology against her, she turned it around. When she was expecting Bilawal, they announced elections around the dates they thought she would be in maternity. I cannot forget her coming to the political rallies with her intravenous drip in her hands… When she was expecting Bakhtawar during her premiership, the crisis was once again carefully chosen to coincide with the dates of her delivery. She did not make herself absent from her office for more than 48 hours. Despite the hurdles, despite being always under siege – “We were in government but not in power” – she would say – she achieved much. Her son Bilawal lists some of these accomplishments in his tributeto his mother. The hostile establishment remains hostile but the President no longer has the power to sack an elected government. This is one of the current elected government’s several achievements that tend to get overshadowed by the explosive (no pun intended) situation around. Other achievements include the Benazir Income Support Programme (BISP), the Aghaz-e-Haqooq-e-Balochistan Package, increase of minimum wages from Rs 4,600 to Rs 7,000 a month, political rights to Gilgit-Baltistan, extension of the Political Parties Act to FATA, bills for women’s rights and empowerment, the 18th and 19th constitutional amendments (that include getting rid of Zia’s clause that allowed the President to dissolve Parliament), the combined NFC Award (moving towards provincial autonomy), signing Iran-Pakistan gas pipeline agreement despite American opposition, forcing the Americans to tie aid to Pakistan to the continuation of democracy with the ‘Kerry-Lugar Bill’ (another reason the military hates this government), kicking out the Saudi ambassador for distributing money to terrorists, expanding the Lady Health Workers programme (initiated by Benazir Bhutto), and continuing her legacy of non-vindictiveness towards political rivals and dissent. It should be a matter of pride for Pakistan that this government has not carried out any capital punishments, in line with its unofficial moratorium on executions. The political situation remains volatile. But there are many positives to build upon. Things will not change overnight, but the process is underway. Despite the apparent unpopularity of the present government, theare is a difference this time round, given that efforts are being made to take preemptive steps to mobilise politically (for example, the Citizens’ statement on the ‘Memogate’ issue) against unconstitutional moves to topple the government. Perhaps some lessons have been learnt from the past. Paris, 2 February 2012 – FIDH expresses its utmost concern about acts of continued repression on political prisoners that have entered in a hunger strike to protest their continued arbitrary detention as well as the deteriorating human rights situation in the country. FIDH has been informed that around 250 political prisoners started a widespread national hunger strike onJanuary 29, 2012, after the prominent 14 political and human rights activists, who were arbitrarly detained since March 2011, announced they will begin a hunger strike in the central Jaw prison. According to the information received, as a response to the hunger strike, part number 4 of the central Jaw prison where the above-mentionned detainees are kept, was reportedly teargassed. A number of them were severely beaten and others were put in solitary confinement. Moreover, those detainees are no longer allowed to make any phone calls, and continue to be denied acess to the designated outdoors areas of the prison. After detainees from the Dry Docks prison announced that they would join the hunger strike, a number of prisoners from different areas in Bahrain were reportedly told that they would be released if they plead for the King’s forgiveness, in addition to saying that they are against the strike and the protests. A number of those who had refused to do so were reportedly beaten severely to the extent that they had to be transferred to the hospital. Some of them called their families informing them they were forced to give apologies on camera. FIDH calls upon the Bahraini authorities to take all necessary measures to put an end to these acts of repression and to order a prompt, effective, thorough, independent and impartial investigation into the above-mentioned acts, the result of which must be made public, and those responsible of such acts must be held accountable.